Germans have a reputation for putting together two separate words to make one word. Their language is also unique in that complex emotions and ideas can be represented in a single word. These words often don’t have an English equivalent. Let’s take a look at a few. You know that feeling when you watch clips on YouTube of skateboard fails where people get hurt trying stupid stunts. It’s the same feeling you get when someone you know gets caught up in a Twitter argument where they get owned. Or when your friend is gossiping about a mutual friend who suddenly walks into the room and you all know that they probably overheard the conversation. No, it’s not Schadenfreude, a German term that has now found popular usage in English, and refers to finding pleasure in someone else’s misfortune. The literal translation of Fremdschämen is „external shame“. The cringe you get in your stomach when you feel embarrassed on behalf of someone else’s gaffe. Translating to „world pain,“ this term refers to feeling like you’re carrying the weight of the whole world on your shoulders. Go back to a time when you watched a deeply moving feature story on the evening news about the plight of a famine-ravaged community in some remote village in Africa. Remember the feeling you were overcome with? That was Weltschmerz. You might visit your favorite online publication and read an article about a heart-wrenching event such as an earthquake that wreaked havoc on a city and feel an overwhelming heaviness descend over you. Weltschmerz. This German word finds its closest match in the „forever alone“ internet meme. However, there’s no English term that fully captures the sentiment represented by the imagery. Literally translated, Mutterseelenallein means „mother’s souls alone“. In other words, no other soul – not even that of your mother – is present. It’s a state of solitude lacking even the slightest hint of intimacy. Including the one which is shared with a mother. It doesn’t get any more depressing. Treppenwitz has served as the premise for countless sitcoms by English-language comedians. „The Comeback“ episode in Seinfeld is a good example of the concept that this word articulates. But there’s still no English term to describe it. Remember when someone threw a curt remark at you in an argument and you wished you had an equally snappy riposte to hurl back in your defense. Only for the clever comeback to pop into your mind long after your scuffle? What you experienced was a Treppenwitz, which literally translates to „staircase joke“. It’s the retort that you think about too late as you descend the stairs while leaving the scene. Think faster next time. Like most English speakers, you might mistakenly assume the Gemütlichkeit simply translates to „feeling cozy“. But, as your German-speaking friends know, you would be wrong. The term speaks to every aspect of your immediate environment. It’s so much more than sitting on a comfortable sofa. It’s sitting on comfortable sofa, listening to soothing music, in the arms of your significant other, enjoying your favorite snack. 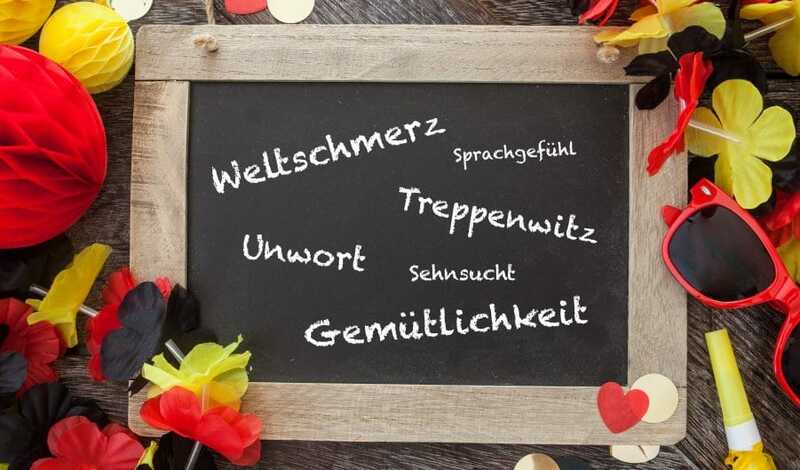 Here are a few extra interesting German terms with no English equivalent. • Sprachgefühl: The ability to learn a new language seems to come naturally to some people. They often end up speaking multiple languages. Besides, it also means that you can express yourself very well in your mother tongue. Germans refer to this innate „language feeling“ as Sprachgefühl. • Backpfeifengesicht: You’ve probably heard the English phrase „a face only a mother could love“. Germans took it a step further and labelled it Backpfeifengesicht, which means „face that should get a slap that whistles across the cheek.“ It’s a face that’s so unflattering you can’t help but smack it. • Streicheleinheit: At first glance this word seems to translate to „caress“. But a deeper look at it reveals a somewhat technical suggestion to it. Streicheln is a verb meaning „to pet“ and Einheit is a noun referring to a unit of measurement. So Streicheleinheit literally translates to „a unit of petting.“ The word helps you express that you are in need of a fair amount of caress. • Sehnsucht: Here’s another word that communicates the nuances of human emotion. The root words of Sehnsucht are sehnen and Sucht. Sehnen means „to yearn or long for“. Sucht refers to an addiction or obsession. You are yearning something so much it feels like an addiction with no hope to ever overcome that longing. The German language is rich with vocabulary that captures the nuances of the human experience in a way English doesn’t. With time and practice, you can grow your German speaking skills. Tap into the vast lexicon of the language, allowing you to communicate anything from a casual remark to your deepest emotions. Sign up for an individual course at Wortland to get started now.